Chuck eye steak is taken from the shoulder area of a cow. It requires strong seasonings and fast, high heat cooking because it is less flavorful and moist than other cuts of beef. If prepared correctly, the high heat will seal juices within the meat for the best flavor. Chuck eye steak requires approximately 20 minutes for the seasonings to soak into the meat. Once seasoned, an additional 15 minutes of cooking is required. Combine salt, pepper, steak seasoning and olive oil in a small bowl. Blend the seasonings with your fingers and rub over both sides of the steak. Leave the steak to set at room temperature for 20 minutes. Preheat a skillet or grill to medium and lightly oil the surface with cooking spray. Cook the steak for four minutes per side and check the internal temperature with a meat thermometer at its thickest point. Continue cooking until it is sufficiently done. The ideal temperature for rare is 125 degrees Fahrenheit, 130 for medium rare, 135 for medium and 145 for well done. Remove the steak from the skillet or grill and allow the meat to sit for five minutes before serving. Alternatively, you can place the steak in an oven preheated to 500 degrees Fahrenheit for 10 minutes. 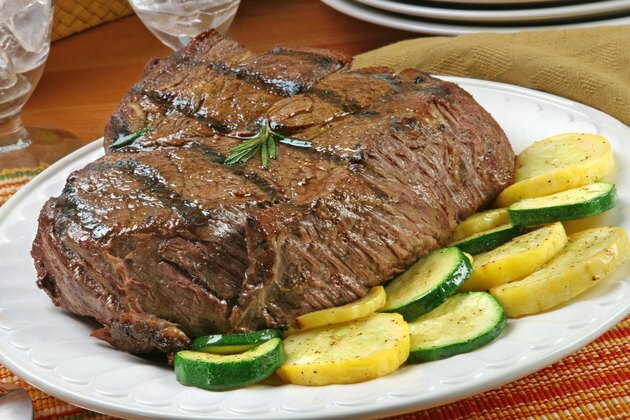 Can I Cook Ribeye Steaks in a Crock Pot?